Power Quest keyboardist Steve Williams shared the Power Quest song ‘Freedom Of Thought’, which was written by Adam, on Facebook today. Power Quest’s début album ‘Wings Of Forever‘ came out 14 years ago. 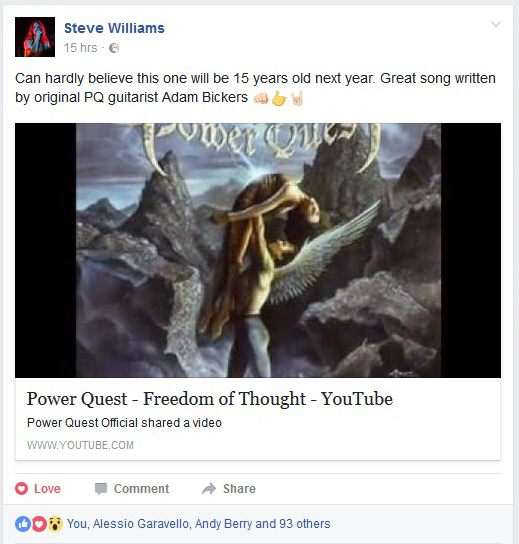 Power Quest have announced they are reforming after a 3 year break. Dendera frontman Ashley Edison is the new lead singer. Their first gig will be at Camden Underworld on September 10th, and they will be recording a new album. We’ve added details of the Power Quest Live At The Underworld DVD to the Discography section. We’ve added a couple more photos of Adam at Bloodstock to our Flickr and Pinterest pages. Power Quest’s set at Camden Underworld on Saturday 31st May 2013 (which featured a guest appearance from Adam) will be released as a bootleg DVD. We’ll have more details on how to buy it soon, check out the trailer on YouTube. We now have some photos of Adam performing with Power Quest at Bloodstock 2013 on our Pinterest board. If you’re going to Bloodstock next weekend, remember to check out the last-ever Power Quest gig, with a special guest appearance from Adam! Power Quest are playing the Sophie Lancaster stage on Saturday 10th Aug. Check out this video of Adam performing Power Quest Part 1 with the band from their Camden Underworld gig on 31st May.